Furnace is very similar to badger except that the outer portion of the feather will range from Medium Ginger to a dark Medium Brown with a black center list. These feathers may also be tipped in black on the outer edges. Feathers that are "red" and have the very outer tips black are often referred to as "Coch-Y-Bondou" . 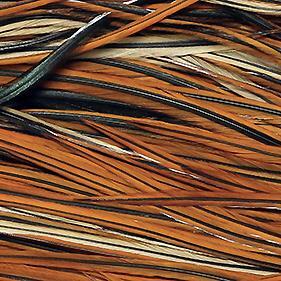 Feathers that have a medium ginger outer color are often referred to as "Greenwells Hackle". All the photos are of the actual cape or saddle we have in stock.